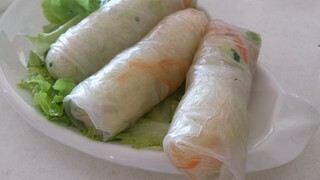 A while ago I went with Amy to Pu Kwong for lunch, followed by stocking up on Tofurky, Gardein and Vegenaise at the local IGA supermarket near there. 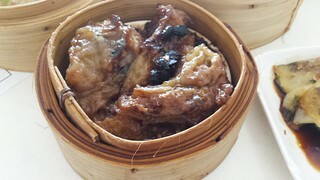 You can see my other Pu Kwong eating adventures here. 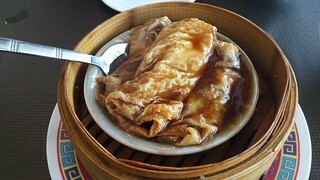 We shared some entrees, starting with my favourite steamed Bean Curd Rolls ($5). I just love these! 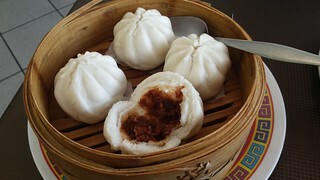 And some Steamed BBQ Pork Buns ($6.90). Normally you only get three in a serve, but they kindly gave us four. 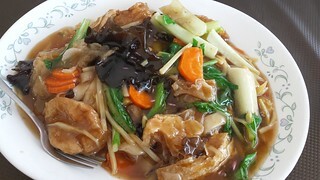 Amy ordered the Stir-Fried Beef with Hofan Noodles ($12.90). I tried a bit and they were excellent! I wasn't the biggest fan of the mock beef texture, but the flavour on the noodles was so yummy! It was a noodle kind of day. 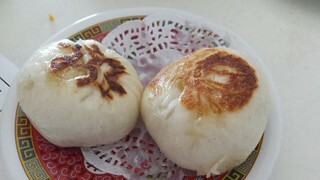 I ordered the Buddha's Special Hofan Noodle ($12.90). It was HUGE! Bigger than my head. It had green veggies, carrot and lots of mushrooms. I also thought it had tofu, but those tofu looking things were something else kind of chewy? It was good, but the sauce was a little bit oily and could have had a bit more flavour. 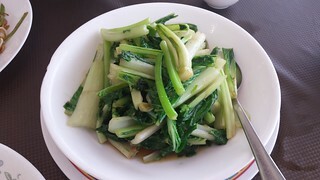 And, of course, some Stir-Fried Greens in Ginger Sauce ($10.90), because you should always have some greens! Wowsers, what a week. I've been struck down with the worst sick I've had in a while. There was a time there when I could barely eat. And if I am turning down food, you know things are serious. I was only able to take one day off work, and have spent the last three days there (the last two days with no voice). 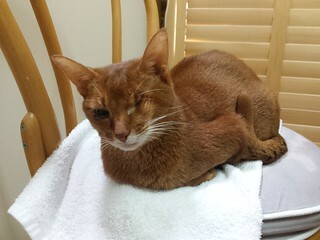 So today, this glorious Sunday, I am just lying around at home, drinking tea and soup, and hugging the cats. And finally getting this blog post up! Veganomicon... does it need an introduction? Probably not. So let's get to it. 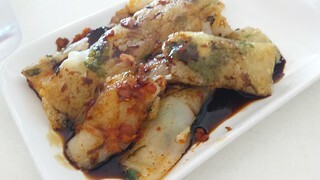 I haven't used Vcon for awhile, but looking through some of these recipes I've made in the past, I need to revisit it. You can see my other posts about Vcon here. Baked Apricot BBQ Tofu: I love BBQ tofu, and Vcon has a recipe for two different sauces you can use on yours. 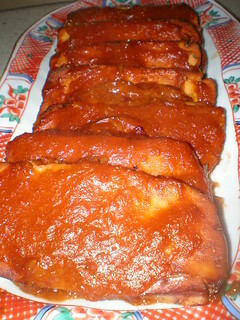 One is regular BBQ, but there is also an Apricot BBQ sauce, which is what I used here. It was very good! 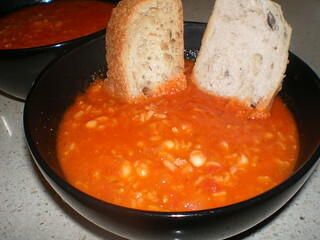 Tomato-Rice Soup with Roasted Garlic and Navy Beans: This is a hearty soup, that makes a bunch! Very good for feeding a lot of people, or for lots of leftovers. The roasted garlic is a very nice addition. I can never find tinned navy beans here, so I used cannellini beans. Also served with some olive and thyme sourdough. 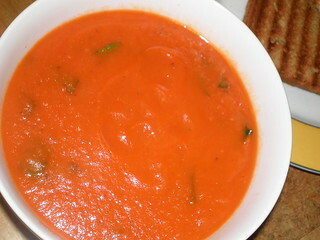 Creamy Tomato Soup (with Basil variation): This is a great tomato soup, with a very intense flavour. It has sundried tomatoes as well as canned tomatoes in it, and is made smooth and creamy by potatoes. There is a basil variation, which I have made as well - basically just stirring through some basil. But whichever way you have it, it is good. Especially with a grilled cheese! 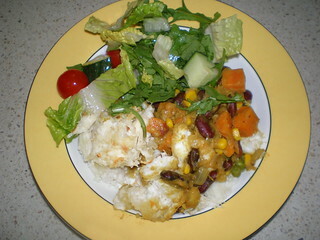 Jamaican Yuca Shepherd's Pie with Sweet Potato, Kidney Beans, and Plantains: This is a nice take on the shepherd's pie (and the filling is also nice on its own as a curry over rice). I have never found fresh yuca here, so I used frozen. I also used peas in place of lima beans in the filling. Oh yeah, and left out the scotch bonnet peppers! I couldn't find Jamaican curry powder anywhere, but the recipe notes it has some star anise and coriander and aniseed, so I added a bit of Chinese 5-spice to some curry powder for a completely inauthentic knock off attempt. Tasted good! 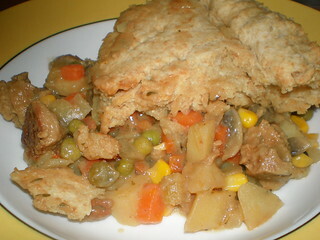 Almost All-American Seitan Potpie: A very hearty dinner! I increased the amount of vegetables in the filling because that is how I roll. Pot pie isn't something I grew up with, but something I do enjoy now as a vegan. The crust was pretty easy to bring together, and was a nice pastry. After this photo it was drizzled in ketchup because that is how I feel pot pies should be served. 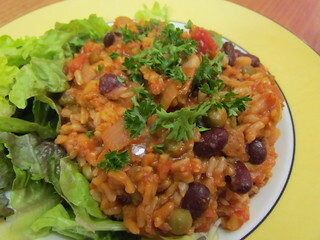 Seitanic Red and White Bean Jambalaya: For me, this dish was missing something. It was OK, but not wow. Which is a bit of a shame, because it made so much. I had to use two casserole dishes to cook it in the oven (it does say to use the biggest pan you have). Spaghetti Squash Mexicana with Salsa Fresca: Hmmm.... spaghetti squash. It was unavailable here for ages, but is trickling through now. Sometimes at outrageous prices, but I have found it at decent prices sometimes and picked one up. First up, spaghetti squash in no way replaces pasta for me in any way, shape or form. Pasta is pasta, I love pasta. Spaghetti squash is its own thing. It's own not very filling thing (if I have it, I have to make sure I have some carbs somewhere else in the meal, or I die). 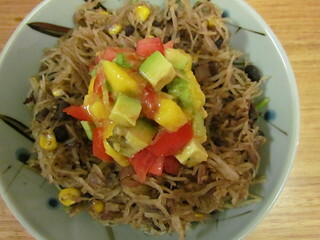 The bean mixture that it is tossed with is nice here, with black beans and corn in a gentle spice. The best part is the salsa. 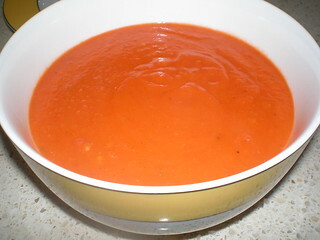 The salsa recipe is included on this page, but it is also a separate recipe in the sauces section. It is great! 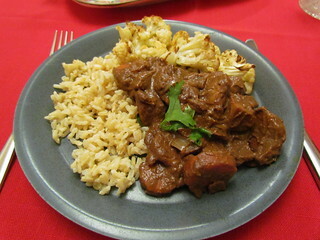 Seitan in Mole Sauce: This has a great flavour. The mole sauce is made from scratch, and is really nice, and is mixed with the seitan, carrots and onions. I served with with brown rice and roasted cauliflower for my dad's birthday one year (see the tablecloth, that means special occasion!). 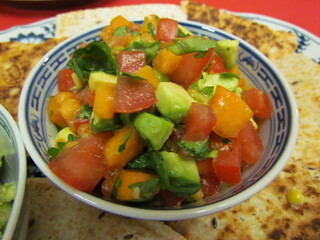 Tropical Avocado Salsa Fresca: Just coming back to that salsa again, it is pretty much the greatest salsa you will even eat. You can choose between mango, pawpaw or pineapple. I have made it with both mango and pawpaw, they are both great options. My mum has an avocado sensitivity, so I made a portion for her using cucumber instead of avocado that was still nice and fresh. Please make this forever. Do you have Veganomicon? What are your favourite recipes? The final in my 'Dim Sim On Her Back In My Lap' series. Behold the awkward leg placement. Bless her. 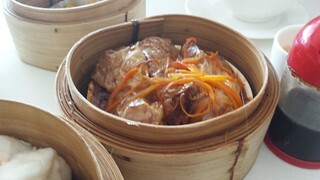 Back in May (I know, so far behind) I went with my parents down to Easy House for a mother's day yum cha. We are serious yum cha eaters! 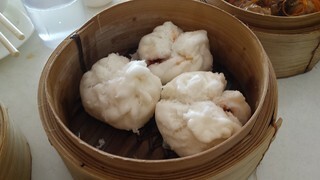 Plus, three people is the optimum number for eating the most things at yum cha. Here's what happened. 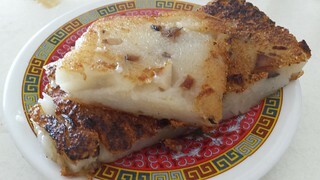 Pan-Fried Noodles with XO Sauce. 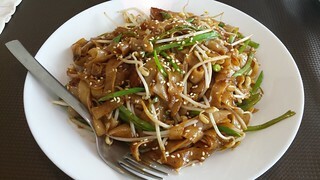 More Pan-fried Noodles in XO Sauce. They are Mum's favourite. 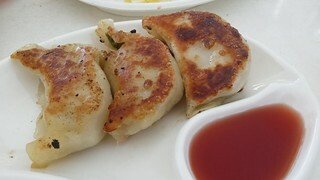 Pan-Fried Dumplings. I love the vinegary sauce these come with. 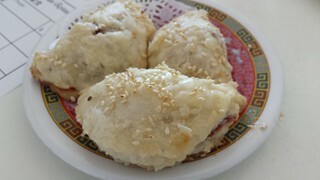 Pan-Fried Vegetable Buns. These were a special for the weekend. 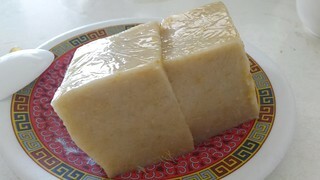 Mango Pudding. 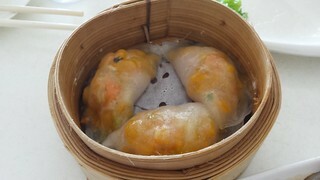 My favourite way to finish yum cha. It was a pretty grand effort! And we were very full for the drive home from the coast. 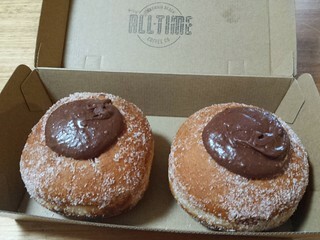 On the way home, we stopped into All-Time Coffee Co to pick up some Notella doughnuts we had pre-ordered. 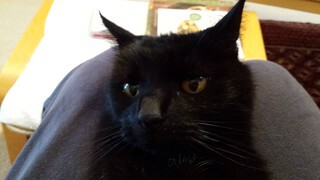 Continuing my series of Dim Sim lying on her back in my lap posts, here is a close-up of her face. Not impressed. Not amused. But she didn't run away! Here are some sweet treats I have been enjoying over the last few months. 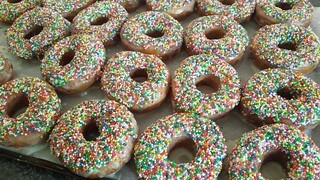 My friend Amy made these super cute sprinkle doughnuts. I am too scared to deep fry doughnuts, but Amy is super brave! 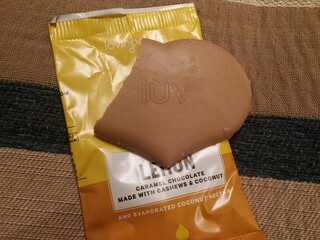 This Loving Earth Raw Lemon Caramel chocolate is delicious, even though I don't normally like raw chocolate or caramel things. I like a lot of their other flavours as well. 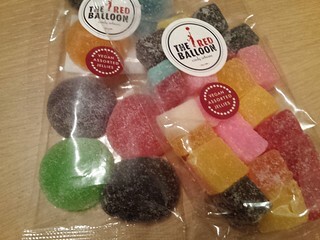 I won some vegan jubes made by Red Balloon in a competition a while ago. While not all of the flavours were my cup of tea (it was assorted, and I wasn't sure what a flavour might be until I committed and bit into it), the ones that were to my taste were very nice. Good texture. Fairy bread is great! If you aren't Australian, then you have been missing out. Bread (white to be the most authentic), margarine and Hundreds and Thousands! The important part is that hundreds and thousands are multicoloured little hard balls, they are not the longer sprinkles that seem to be around in the US. This is crucial. 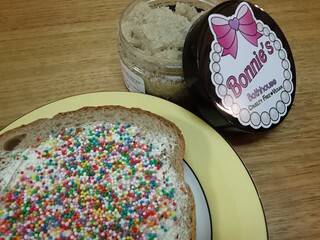 The day I found vegan hundreds and thousands, I ate so much fairy bread! Also pictured with the Sugar Hex body scrub I got from Bonnie's Bathhouse, a local vegan skin care company. A terrible photo of some great trial mix I made. 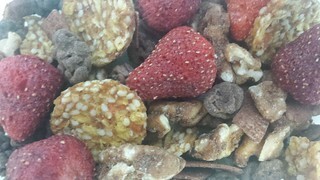 It has freeze-dried strawberries, mini raw carrot cake cookies, chocolate covered raisins and maple walnuts and chocolate covered coconut in it. So good! 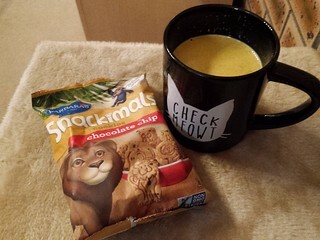 A ridiculous snack I made. 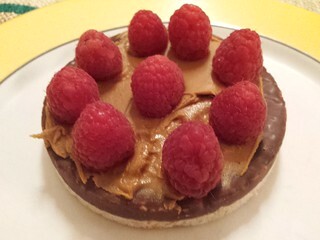 It is a chocolate covered rice cake spread with Speculoos and topped with fresh raspberries. 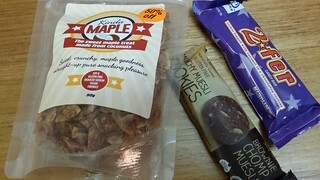 I picked up these treats last week from The Green Edge. Haven't tried them yet, but excited to. The chocolate bar is the Go-Max-Go version of a Twix. I loved Twix bars, and have been waiting for someone to make a vegan one for years. I expect that I will eat it, declare it far too sweet, and there will end my cravings. 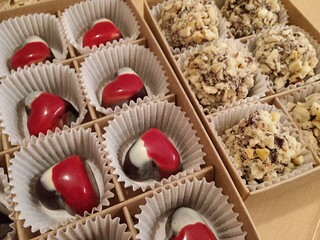 And finally, these stunning chocolates that I ordered from Treat Dreams. Treat Dreams is a small vegan handmade chocolate business based in Sydney, and they have recently started shipping interstate. It was a bit of a wait from ordering to delivery, but the wait was worth it. There are their version of Ferrero Rochers, which are way better than the original. But most importantly, the Strawberry and Cream hearts. They are the most amazing chocolates! I love them so much. I want to marry them. Alas, they are a bit pricey to be a regular occurrence. What sweet treats have you been enjoying lately? 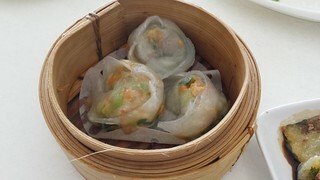 As promised, the first in a series of Dim Sim posts. 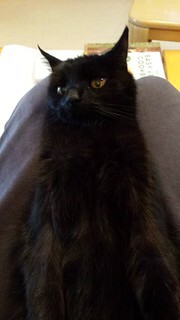 The other day, I somehow convinced Dim Sim to lie on her back in my lap. As you can see, she was not incredibly impressed. But she let me rub her tummy. I have quite a bit of catching up on my Eating Out posts... this last weekend I had friends visiting and we ate our way around Brisbane for two and a half days! However, there are a few things to get through before we get to that. A while ago, I went to Buddha's birthday at South Bank. 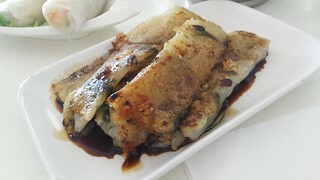 This is held every year, and includes a vegetarian food festival as well. It isn't all vegan, so you do need to ask around, but there are lots of vegan options. It was a horrible, cold and rainy day. And I was ready to bail on the whole thing, but my Mum was keen to go, so we went. Just for a little bit of food, trying to stay out of the rain (there really were no undercover areas for eating). On the plus side there were not many people there! Normally it is packed. Please excuse the bad photos, they were taken balancing an umbrella and the food and my phone. 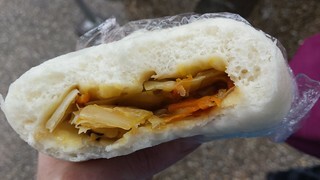 I started with a steamed vegetable bun from a random stall, which was hot and yummy. 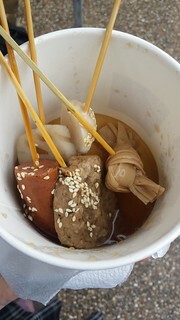 There was a stall selling cups of five skewers, so I got a random assortment of the vegan offerings. I wasn't the biggest fan, the mock meats were not the greatest quality, and one of them was seafood-like, which I don't enjoy. 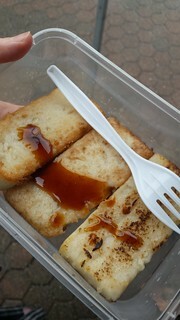 I also got some yummy radish cakes from the Su Life stall. 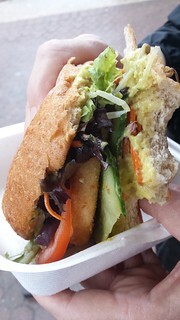 Mum ordered a Satay Burger from the Vege Rama stall, which wasn't good. 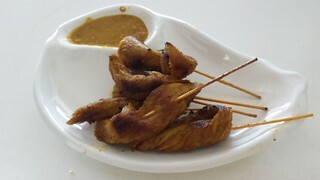 The sauce was just at thin curry sauce, no obvious peanut to it. And the patty was meh. 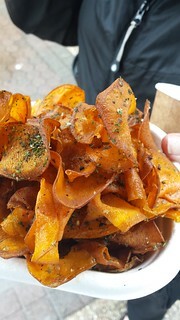 We also found a sweet potato chips stall, and ordered some. Though instead of being the proper chips/fries that we were expecting, and that other people had been walking around with, they were more like chips/crisps... OK briefly but then just very oily. We decided to spread out through South Bank for some sweets. 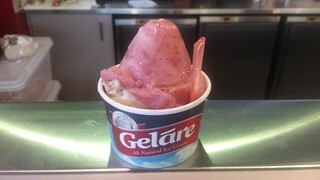 Normally I go to Beach House for vegan ice cream, but I decided to give Gelare a try. Unfortunately no vegan cones, so you have to get cups. Most of the flavours are fruit based sorbets, but they did have a chocolate and a green tea one as well. I got Strawberry Fields and Banana Caramel scoops. The strawberry one had that very strong, almost too sweet taste that I find sorbets often have, but mixed in with the banana one it was like a nice strawberry ice cream. 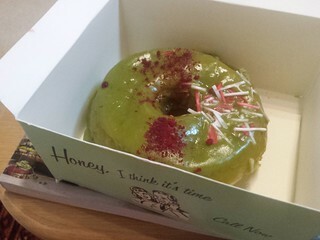 I also stopped by Doughnut Time to try their Matcha Made In Heaven vegan doughnut. The slight bitterness of the matcha actually helped bring down the sweetness of the glaze. It is my favourite glazed one I have had from there. 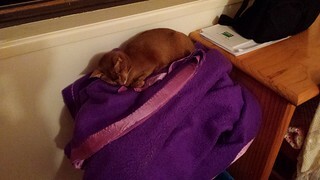 Just another one in my series of 'Sahara on the blanket' photos. 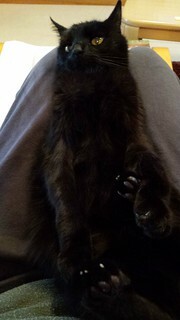 Don't worry, next post I shall start a series entitled 'Dim Sim on her back on my lap'... you don't want to miss it!